Ann Hirsch named finalist for Suffrage Movement Monument in Central Park NYC! I’m honored to announce that my proposal was selected from among 91 other submissions from across the U.S. to be one of four under consideration for a sculpture honoring the Woman Suffrage Movement. 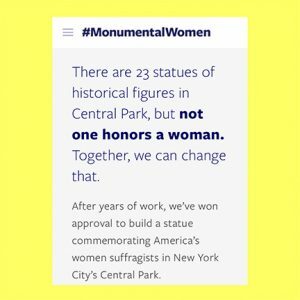 The monument, which has arisen from the #MonumentalWomen campaign to create the first statue of real women in New York City’s Central Park, will be installed on The Mall in Central Park in 2020. For her proposal, go here .